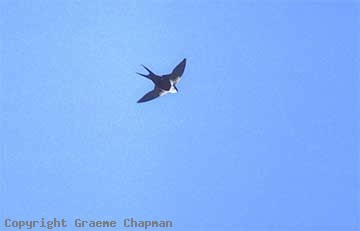 White-backed Swallows occur over most of southern Australia except for far southern Victoria, Tasmania and the far SW of W.A. - they are more often seen in fairly open country inland, away from coastal regions, and usually coinciding with the sandy places that provide the vertical banks where they excavate their roosting and nesting tunnels. 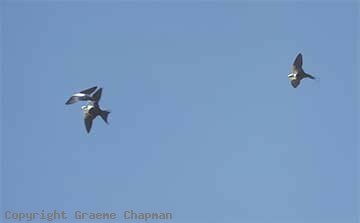 White-backed Swallows are quite sociable at times. 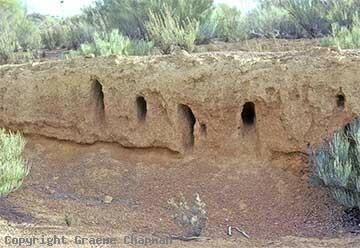 When nesting, each pair occupies a nesting tunnel about a metre long in which they build a grassy nest and incubate five or six white eggs. Occasionally there are several nest tunnels in close proximity. However, in winter they are known to roost together in a single burrow, as many as 30-40 birds together. Like many of our other birds that feed high in the air, they sometimes need to employ a strategy to conserve warmth, particularly in cold weather. 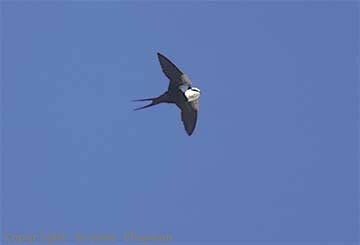 In this case White-backed Swallows have been recorded huddled together in a state of torpor in their roost burrows. Even in the nesting season, on colder mornings after leaving their burrows they often warm up in the sun on some favourite little perch. The habit of roosting and nesting in the ground is not without its disadvantages. The nest holes are often dug out by goannas (see pic 358204). This would have been the case for a very long while, but in recent times, foxes have proven to be a much more effective predator, to such an extent that White-backed Swallows are now a fairly unusual sight in the inland. 358204 ... Nest tunnels dug out by foxes or goannas.